A system is a set of interrelated parts that form a whole. A system is not the sum of its parts, but rather the product of their interaction. Systems thinking is way to make sense of a complex system that gives attention to exploring the relationships, boundaries and perspectives in a system. It is a mental framework that helps us to become better problem solvers. As system thinkers we can find ways to shift or recombine the parts in the system to offer an improved outcome. Systems approaches are the specific tools and methods we can use to better understand the system and the complex problems within it. They are particularly useful because they do not require us to know everything about the system before engaging in problem-solving activities. A combination of systems thinking and approaches helps us to see the big picture – how the problem we’re trying to solve is made up of connected and inter-related components, so that a change in one part will influence other parts. It is also a way to understand the complex nature of the problems we’re dealing with and how relationships and behaviours change over time to cause the situation to be as it is. There’s no single explanation for what is causing the problem and no single solution that fits all situations. The Systems Change Framework developed by the Prevention Centre and the Tasmanian Department of Health offers a structure and process for teams and projects to understand and engage in systems change efforts. The Framework identifies the key components of the learning context in which the work should be carried out in, as well the critical steps of inquiry used to investigate the system of interest. When considering systems work, it is important to first determine the kind of problem you are working with, and choose the approach accordingly. First, we need to understand the type of problem we are addressing. Is it simple (how to fill a hole in the road), complicated (how to build the road) or complex (how to address traffic congestion)? Adapted from: Westley, Zimmerman and Patton. 2006. Getting to Maybe: How the world has changed. Identify leverage points for systems change. Challenges can arise when problem-solving approaches that are useful for complicated problems are applied to complex problems. This can often result in quick fixes that fail to recognise and intervene in the root causes of problems. It can also lead to new or worse problems because we have failed to understand the relationships between parts in the system. By recognising the complex nature of the problem, and applying systems thinking approaches, investigations can delve below the surface and identify the fundamental and interconnecting causes of the complex issue – such as the patterns of behaviour, the underlying structure and the beliefs of the people and organisations responsible for creating that complex issue. There are a number of ways in which systems thinking differs from conventional thinking in terms of how we conceive of and approach problems. This influences the goal of an investigation into a problem, and who and how we chose to engage people and resources in the investigation. Adapted from: Ison, R. 2010. Systems Practice: How to Act in a Climate-Change World. Systems thinking and approaches include both a way of seeing the system (a perspective) and the application of a set of tools and methods. It is important to distinguish between the two, as well as to understand how they need to be taken together to understand the system as a whole. Systems tools and methods seek to serve a particular purpose, have a specific strategy for implementation, and have data input requirements. They require the user to develop proficiency, and once achieved, the tool or method can be applied over again. In undertaking systems thinking activities, we want to have a high capacity to see and sense a system (i.e. patterns, structures, relationships, boundaries, feedback loops and unintended consequences of actions). We can build our capacity to do this by engaging regularly in a systems thinking practice. This means regularly reflecting on our assumptions and mental models, and exploring unintended consequences of actions and how we listen and learn from other perspectives. These practices will enhance our capacity to see and sense the system when we engage with specific tools such as causal loop diagrams or systems mapping. Systems tools and methods can be applied by anyone to any situation. However, the outcomes will be influenced by the perspective of the individuals applying the tools, and therefore different results will be achieved each time. When a practitioner has a strong systems thinking practice, this will shift and broaden the available outcomes of the work because a wider range of inputs are engaged. Short video: Why use a system’s approach? Long video: Nudge and public health: what can we learn from the British experience? This section features the best reads and resources we have identified to help you gain a better understanding of systems thinking. The section is compiled by Dr Seanna Davidson, Manager of Systems Thinking and Capacity Building. This report draws on the experiences of ten ‘systems leaders’ in the UK’s National Health System and examines the leadership style needed for systems change. This resource will be valuable to those seeking to understand what systems leadership looks like in a daily context. As practitioners wanting to build their systems skills, this resources helps to identify and demonstrate how personal skills are critical to engaging with complexity, and the impacts of modelling that in our work. This book is about codesign (involving multiple voices in a collaborative design process) on a massive scale. Massive codesign is applicable to complex scenarios that require the engagement of multiple diverse actors in processes to tackle the problem, and who will need to collaborate to achieve a goal. The book proposes a Collaborative Design Framework, “to identify and structure codesign activities, methods and tools” and offers ‘lessons learnt’ as guidance to others undertaking massive creative design processes. This book is specifically aimed at providing practical guidance, and discusses codesign activities from the designer’s point of view. It includes an analysis of four applied-research activities using the Collaborative Design Framework, which offers insight for those undertaking similar activities. This resource will be of interest to those who are directly engaged in applied systems work, who are working in a large group social setting. This report brings together stories from researchers and practitioners across Australia and New Zealand of their experience working in systems. The authors share the “processes of learning, adapting and journey-making” encountered through their work in the hope of supporting others on their own systems thinking journey. Taken together, these stories provide a compelling insight into how researchers and practitioners are applying systems thinking and methods in their work. While this serves to demonstrate the breadth and variety of systems approaches, the final chapter summarises key insights on what is being learnt about systems efforts across these contexts and scales. The report also shines light on the subjective experiences of those engaged in systems work, and the challenges and rewards of learning to work in this way. The experiences and reflections shared in these stories will be valuable to those wanting to engage directly in systems work and move from the conceptual to real world application of systems thinking. What is this resource? An academic article exploring the concepts of systems thinking and systems practice and investigates their intertwined nature. Why is it worthwhile? The article provides some conceptual grounding which helps to explain the need to practice systems in order to obtain a better understanding of systems thinking as a concept and theory. The article is also useful for outlining the systems relationship to action research. Who is it useful for? This article will largely be useful to systems researchers writing and reflecting on their research projects and outcomes and how to communicate this to external audiences. To date, there have been few studies published to help answer this question. This case study of systems based practice provides welcome insight into how systems concepts were interpreted and applied in practice by health promotion practitioners, as well as the barriers and enablers to systems thinking in practice. Who is it useful for? The insights from the case study will be valuable to those wanting to engage directly in systems work and move from the conceptual to real world application of systems thinking. The resource will also be of interest to researchers and academics. What is this resource? 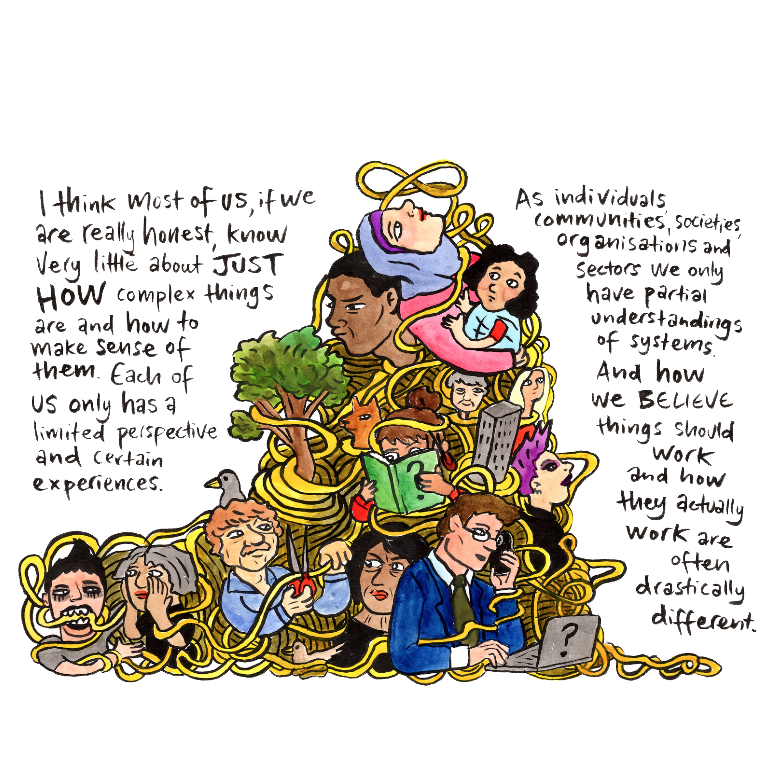 This illustration uses visual storytelling to explain complexity in a simple and accessible way, following the author’s personal experience of learning about complex systems. Why is it worthwhile? This story brings complexity and systems thinking, which can be highly technical and jargon-filled, down to earth by situating them within a history of scientific thought and showing their application through real world examples. Who is it useful for? This resource is useful to those engaging in systems change work who are looking for a simple way to communicate what they do to those unfamiliar with the concept. What is this resource? Systems thinking is not just about methods and tools, it also incorporates and relies upon a personal capacity to think deeply about complex problems. Why is it worthwhile? Part of what makes complex problems so ‘wicked’ is that they are dynamic and unpredictable, so that solutions that may work reliably for simple or even complicated problems are not enough. In these situations, we need to think differently about the nature of the problem in order to improve decision making. Who is it useful for? This resource is written for a general audience and may be valuable to those who are interested in exploring their own mental model and developing their personal ability to make sense of systems through regular practice. What is this resource? This blog post discusses the practical tools Policy Lab are using to ‘bust’ cognitive biases and support policy-makers to make more informed decisions. Why is it worthwhile? The first blog post in this series discusses cognitive biases related to ‘noticing’. These biases pull policy-makers towards familiar ‘default’ solutions and to information that confirms existing beliefs. Sabherwal outlines some of the tools and strategies used at Policy Lab to address biases in the context of complex policy challenges, and links are provided for further information on each of these. Who is it useful for? This blog series will be useful for anyone engaging in decision making practices, but especially so for systems thinkers wanting to build their systems practice. This academic journal article provides a systematised review of the literature on cross-sectoral partnerships for systems change. The article provides a bird’s-eye-view on how ‘systemic change’ is described across a broad range of multidisciplinary literature, and provides a definition. It also outlines how systemic change has been sought as an aim within cross-sectoral partnerships. This article will be helpful for those seeking guidance through the vast literature on the concept of systemic change and, as the authors note, may be useful as a step towards building effective bridges across disciplines. This short grey literature article uses several business case examples to highlight the importance of smaller, targeted changes as leverage towards larger systems change. Often, the situations we seek to change through our work can be overwhelming. Grand, aspirational visions of how the system could be radically different are often too vague to lead to purposeful action. Mühlenbein argues that by breaking a vision down into smaller goals, we can focus on developing actionable strategies for targeted systems change. This resource will be useful for those working to bring about systems change. This is the first of three blog posts in a series that consider scale as used in the social sector. The authors first identify the three common forms of scaling that are used in the social sector, and then focus on introducing two new forms of scale that enrich how we might think about innovation for systems change. Three forms of scaling (up, out and deep) dominate the literature, but these are not the only directions for achieving change. Greater focus should be given to scaling the conditions that enable innovative solutions to be developed and thrive in the local contexts to which they are relevant. Tulloch writes, “the signature of a worthy idea is not necessarily that it is scalable” and the proliferation of local solutions is not to be feared. This article will be particularly useful for policymakers and practitioners who use and consider the concept of scaling. It will help to clarify the concept of scale as used in the systems space, which differs from how the concept is applied in public health and health promotion. Article: The application of systems thinking in health: why use systems thinking? This paper is a commentary in the Health Research Policy and Systems Series on ‘Advancing the application of systems thinking in health’, edited by Taghreed Adam. The paper examines the usefulness of applying systems thinking to the complex challenges faced in global health. It provides an overview of the origins of systems thinking and commonly used theories, methods and tools. It serves as an accessible introduction to the topic for people in the field of public health, while also making a compelling argument for the appropriateness of the approach for understanding the more intractable challenges in global health. Peters argues that systems thinking methods, particularly modelling, provide a new opportunity in global health to identify and test hypotheses, calibrate models against real data, and continuously improve our understanding of how to intervene to improve health. The article is well suited to those who are new to systems and work in the public health space, looking for an introduction to systems thinking. A methods handbook that outlines ways to carry out systems thinking in health, with real-world examples. Methods include system dynamics and causal loops, network analysis, outcome mapping, soft systems methodology. For those looking for a tools based approaches to systems work, and with opportunity to learn and reflect on case examples from health systems. The book is written by an international team of experts in health research. This resource will be of interest to those wanting to engage directly in systems work, and will be relevant to practitioners, policymakers and researchers. A facilitation guide for running an systems activity in a group setting. The guide lays out the purpose, intention and steps to follow, as well as how to analyze and make sense of the outcomes. The focus of the activity is to map out a discernible change in a systems of interest to understand how it has happened and its influence on other parts and dynamics in the systems. Systems work often takes place in large group social settings where actors in the system are brought together. Yet detailed facilitation activities are not frequently produced, requiring systems actors to rely on external facilitators. This guide offers clears steps and processes for running this activity. Additionally, reflection on how and why a systems is changing can help to inform future efforts and offers a valuable opportunity for actors to learn about change in the systems together, thereby strengthening opportunities for collective action. An academic journal series in the Health Research Policy and Systems journal with a theme of “ Advancing the Application of System Thinking in Health”. The production of this series was coordinated by the Alliance for Health Policy and Systems Research, World Health Organization and produced in 2014. The series includes 12 case studies in the application of systems thinking in health in the global context. Specific case applications of systems in health contexts are still fairly few and far between, this series provides a useful compilation of recent research which touches on a breadth of topics including leadership, capacity building, and behaviour change. It also includes a highly cited article laying out the rationale for systems in health. This resource will largely be of interest to academics, but the insights from the case may also appeal to practitioners and policymakers. A workbook that details the 14 key systems thinking habits identified and tested by the Waters Foundation, a leading organization in building curriculum and processes for applied systems thinking. For each habit, the workbook outlines why the habit is important, an activity to practice the habit and reflection questions to follow up on the practice. Shifting our personal practice around how we think and engage with information is a key activity of becoming a systems thinker. This workbook provides specific, tangible and accessible practices to build these habits. The more our mental models are informed by a systems perspective, richer insight and ideas will emerge about how to attend to our complex problems. This resource will be of valuable to those who are willing and interested to explore their own mental model and ways of thinking through active and regular practice. This article, from consultancy Roller Strategies, offers practice-based rules of thumb. These guiding principles cover engaging in complex systems as well as enabling change through interventions and leverage points. At moments of confusion or uncertainty, practitioners can return to these guiding principles and apply them as criteria for decision making to determine what has unfolded and why. They help to inform how to act, and what we can expect in this kind of work. This resource may interest those wanting to engage directly in systems change work. This resource reflects on lessons learnt from a systems change experiment that involved multiple stakeholders. It examines systems leadership issues and how to enable effective systems leaders. It includes a short literature review on systems leadership and outlines systems leadership attributes and skills. Significant focus has shifted towards working with ‘systems’, particularly in funding agencies and philanthropic agencies who are seeking greater impact beyond traditional program outcomes. However, understanding of how to enable systems skills and capacities in individuals, agencies and regions is only just beginning. This report offers some initial ideas identifying systems skills and how to build this capacity at a regional level. This resource will be of interest to those wanting to develop, teach or enable systems skill and capacity. A set of four short (five mins) videos, in which two of our Scientific Advisory Committee members and a research project lead share their perspectives and insights on system thinking. Those interested in systems often grapple with the question, “What does this look like in practice?”. In these videos we hear from three leading system thinkers who offer a pragmatic perspective on what it means to do systems work. This resource will be of interest to those wanting to hear the stories of systems work, and the move from the conceptual to the practical struggles and opportunities of working with systems. This short report highlights nine propositions for how to approach evaluation in complex situations. The accompanying webinar explores the approaches and case studies in more depth. Evaluation traditionally assesses the impact of programs according to pre-determined indicators, but this may not work when evaluating complex initiatives or initiatives operating in complex environments. These nine propositions can help evaluators navigate the unique characteristics of complex systems to improve their evaluation practice. This resource will suit practitioners and researchers designing evaluation programs for complex initiatives who need a starting point to understand what data to collect, how to collect it and how to use it to tell a story. This is a handbook reference for conducting community based systems dynamic modelling, based on work by the Brown School Social Systems Design Lab at Washington University. There are very few resources that help people understand ‘how’ to do systems. This is one of the rare resources to do so, by providing not only a conceptual understanding but support for facilitating and hosting space where modelling can happen. Importantly, it also considers how to bring people into the room before the modelling begins – ensuring we have diverse perspectives from which to build the model is half the challenge. The book also provides details on what to do after the model is built and its continued use in the systems process. Systems dynamic modelling is often left to the realm of experts and modellers. This handbook provide an accessible entry point for everyone else interested in participating, enabling or leading community-based systems dynamics. This is a report produced from a workshop gathering of the Social Innovation Exchange (SiX) Funders Node, a pioneering group of leaders financially supporting systems change around the world. The report briefly outlines the conceptual model of systems change that the participants and their home organisations use. It outlines four cases studies of large philanthropic organisations showing the challenges and opportunities for systems change from lived experience of system change makers. The case studies highlight elements such as selected leverage points, measurements for impact and enabling conditions. This resource is useful to anyone engaging in systems change work who is seeking to better understand how it plays out in real-life contexts. This is a report produced by the systems change collaboration Social Innovation Generation (SiG) in Canada, and the Systems Studio based in New York. Both authors have been instrumental in the field of systems change in North America, through philanthropy and design and implementation of systems change labs. In this report they reflect on experiences and processes to identify the necessary roles and activities required to support systems change. They also explore the thematic areas in which systems change is taking place and provide notable examples of organisations working on these challenges. This resource is appropriate for policy makers, philanthropic organisations and not-for profit organisations who are seeking to understand the enabling conditions and networks that can facilitate systems change. This is a synthesis of workshop discussions on systems change terminology. Leading systems change experts in Britain identified that language was a key challenge to systems entrepreneurs, and a leverage point for systems change. Participants noted that a significant barrier to conducting systems work was being able to effectively describe systems processes in a way that was clear, meaningful and engaging to others. While the report does not provide consensus, it introduces a shared lexicon which other system actors can draw on. This resource is useful to anyone who is engaging in systems change work who struggles to characterise, describe and communicate what it is they are doing and why. ‘Systems Practice: A Practical Approach to Move from Impossible to Impact’ is a massive open online course (MOOC) for systems thinking, run by Acumen and The Omidyar Group. This course offers a structured learning environment with an opportunity to test and apply systems thinking tools to your own project, either on your own or in your team. This course will lead you through each step of understanding a system, analyzing it to find points of leverage, and learning how to adapt in a changing environment. You will also gain access to a portfolio of step-by-step tools, processes, and mindsets to apply to your current and future work. This course is appropriate for professionals working on complex problems across any field of social impact. A systems practice journey has the potential to transform the way you work, think, and view the world and can get you closer to your goal of creating sustained positive impact. These resources are on the theme of developmental evaluation (DE). Developmental Evaluation is evaluation used to support the creation of program policies, interventions or innovations that operate in a dynamic, novel and complex environment. The evaluation focuses on learning through feedback while programs are in development to enable the most context appropriate and feasible design outcome. The first resource is an online toolkit for DE, which gives a general introduction to the practice, why and when to use it, and some of the skills required, as well as a list of tools and how to apply them. The second is a practitioner’s handbook on DE that delves deeper into how to apply DE practices, what they can surface in terms of learning, and challenges that can arise. The final is a keystone resource written by the leading DE practitioner that discusses some of the more theoretical and abstract concepts of DE. Applying a systems approach requires us to engage in processes of constant learning. DE grew out of the evaluation literature but has wide applicability to systems work because it approaches learning while doing, instead of learning after completion of an activity. In systems we need to constantly re-orientate based on what we see emerge from the system. DE provides tools and practices through which to do this. Experienced systems practitioners who are looking to expand their suite of reflection and action learning tools. DE is also appropriate for those in long-term programs and who are moving beyond post-program evaluation practice. A non-academic book written for systems practitioners from a soft-systems approach (a series of facilitated activities that take a group through a problem-solving process, generally applied to complex social issues). This book is a useful resource for those wrestling with ‘what does this look like in practice’ and wanting step-by-step outlines for group processes. It outlines processes to facilitate systems work in a group setting. Written in a highly accessible tone, the author, a systems practitioner, shares her experiences with these tools, covers the messiness of working in systems, and explores more deeply what a process of inquiry and action learning looks like. Practitioners who want to apply a soft-systems methodology, or those looking for examples of systems practice in real life. A chart of cognitive bias that affect decision making. In order to engage in systems thinking, we must become aware of the values, worldviews and experiences that frame our perspectives. All of these inform – and often limit – our ability to ‘see’ the system. A system thinker engages in self-reflection as a step towards engaging and learning from the perspectives of others. A useful tool for gaining this awareness is interrogating our own biases. This chart offers a useful set of triggers to surface and consider our bias and how this informs our perspective on the system. Doing so permits us to set these biases aside and consider the system from a broader view. This chart is useful for anyone engaging in decision making practices, but especially so for systems thinkers. This is a handbook of systems modelling tools largely focused on providing an introductory understanding to causal loop diagrams, stocks and flow, and systems modelling. The handbook was created by Dr Daniel Kim, a co-founder of the MIT Center for Organizational Learning. There is a broad landscape of systems tools, many of which are complex and have a rich theoretical and conceptual history, making it difficult to get a cursory view of their applications. This handbook offers an accessible view into several key tools and may help determine which tools are appropriate for which contexts. The handbook will be most useful for those beginning to consider the design of their investigations who would benefit from an introduction to different systems modelling tools. This short article outlines the five steps in systems thinking and modelling methodology developed by Jay Forrester at MIT, a significant contributor to systems thinking. There are many different aspects and approaches to systems thinking, but Forrester’s contribution to the field is significant and has focused on systems dynamic modelling – one of the better known approaches. This is a general access article which is useful in providing an overview of the steps and methodology which may help direct further investigation into this field. The article will be most useful for those who have heard about systems dynamics, and want to gain a cursory understanding of its approach. The Searchable Systems Toolbox is an online database of systems thinking tools. Users can search the database and find appropriate tools based on the kind of systems insight they are seeking. The database includes resources such as visual mapping, narrative reporting, systems process or theories and frameworks. They are rated by time, expertise and participation requirements. You can also search the database by the types of systems questions you want to explore, including people, variables, patterns and structures or learning. Systems work is more than the application of one tool. It is a journey undertaken by a group or in a project that shifts and changes in response to what is learned at each stage. This means there is no one way to conduct a systems investigation, and different tools are useful at different stages, depending on the context. This resource describes and provides access to a full range of tools so you can choose those that are appropriate to the requirements of the group. Originally collated to support grant applications, this resource is useful for those directly engaged in systems change work on the ground and in communities, or scholars looking for applied frameworks for systems change. The Prevention Centre was fortunate to host systems scholar and practitioner Professor Pennie Foster-Fishman for several days in July 2016. Below are some resources from her time here, including a webinar that discusses her systems change framework for working with communities and notes from her case studies, a brief video on the practice of systems change, as well as an academic article outlining the change framework. To complement our conceptual and theoretical knowledge of systems thinking, these resources offer on the ground case studies of systems approaches and provide an insight about the challenges and opportunities of enabling actual systems change. These resources highlight the inherent complexities, unintended consequences and hidden benefits of this work – realities that must be considered and incorporated into our systems change efforts. Who are they useful for? The collection will be most useful for those directly engaged in systems change work on the ground and in communities, or scholars looking for applied frameworks for systems change. This brief video and webpage describe the concept of “emergence” – the existence or formation of collective behaviours – and how it is meaningful in relation to systems thinking. The reductionist paradigm encourages us to break apart elements of a system and consider them in isolation, coming to understand its intricacies. In systems thinking, our focus is to understand how the parts are related and interact. Emergence is the idea that a dynamic is created that can only exist as a result of the parts coming together – a dynamic that cannot be seen or explored when parts are examined in isolation. It is this fundamental principle that underpins why we must examine the system, and clarifies why our best attempts to predict responses to change in complex systems will often fail. The article is produced for a general audience and uses plain language and common examples that will make this concept accessible for most users. This article is written for a general audience and is both useful and accessible to practitioners, researchers and government and policy staff. The article helps the reader to develop the mindset of a systems thinker and approach for systems work. Written by well-regarded US author Donella Meadows, a pioneer of systems thinking from a social perspective, this article will help you understand systems change. Meadows outlines the development of her understanding on how to intervene in a system to enable change. For many of us, it is easy enough to grasp the idea that ‘everything is connected’. What is more difficult to discern is how to move from this broad principle to a more constructive and insightful framework for analysis and understanding. The 10 elements offered by Meadows direct the reader to specific elements of a systems dynamic, which taken together can provide understanding for appropriate places for intervening. Importantly, the list of elements include our own learning and set of paradigms that we use to make sense of our system. Meadows rightly points out that no one paradigm is true, but the collective taken together informs a richer understanding of a system. Given that this article is written for a general audience, it is both useful and accessible for practitioners, researchers and government and policy staff. The article’s utility is in helping one become a systems thinker, that is, their mindset and approach for systems work.